Is AMC Networks a Buy? Cord-cutting has been chiseling down AMC's ad revenue, but the company is still managing to grow as it beefs up its digital distribution capability. AMC Networks (NASDAQ:AMCX) has produced some of the top shows on TV over the last 10 years, including Mad Men and Breaking Bad. Of course, its greatest success to date has been The Walking Dead, which hit its season-premiere high of 17.29 million viewers in Season 5 (2014). A slate of top content helped the company grow revenue and net income by 160% and 310%, respectively, between 2010 and 2017. Despite that performance, the stock has dramatically underperformed the broader market averages, down 8% over the last five years. Cord-cutting is partly to blame, as well as uncertainty as to what comes after The Walking Dead, which is nearing the end of its run. 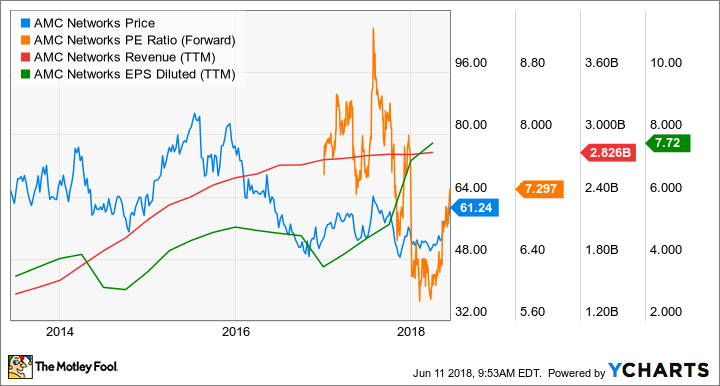 But, with the stock's P/E ratio at just 8 times trailing earnings, the inevitable void left by The Walking Dead may be already baked into the stock price, which means AMC may be too cheap to ignore. AMC generates about 40% of its revenue from selling advertising time over its five network channels: AMC, WE tv, BBC America, IFC, and SundanceTV. Advertising revenue declined 3.1% last year due to cord-cutters; AMC has been steadily losing viewers at the rate of 1% to 3% per year. I don't think this is a reflection of AMC's content but has more to do with consumers finding better value streaming content from other digital distributors like Netflix and Hulu, where AMC also makes money from licensing its hit shows. Something investors overlook with AMC is that distribution revenue, which includes licensing fees paid to AMC by streaming services, makes up about 60% of total revenue and grew 6.6% in 2017, which more than offset the decline in ad revenue. While advertising revenue is gradually eroding, the faster growth of distribution allowed AMC to grow total revenue last year by 1.8%. The Walking Dead has seen viewership decline from around 15 million at its peak to 7.8 million in the most recent season. That's still better than most TV shows, but also leaves investors wondering how AMC will fill that void once the show runs its course. However, the stock trades at such a low valuation that AMC doesn't have to grow much for investors to earn a good return on their investment. If AMC can continue to grow distribution revenue enough to offset the decline in ad revenue, shareholders should do just fine. AMC has a long track record of creating hit shows that win awards, and management has a deep pipeline of new shows in development. The company is investing heavily in ad-free, direct-to-consumer (DTC) services, which it can support with exclusive content from AMC Studios. AMC is seeing increasing consumer interest for its own subscription services. On the first-quarter conference call with investors, CEO Josh Sapan explained how the company will take advantage of this growing interest, saying: "Owning our intellectual property and expanding our AMC Studios operation has been an important area of focus for us. We now have a dozen or so shows coming from AMC Studios and this activity is directly contributing to our financial results." In the first quarter, AMC allowed AMC Premiere subscribers to watch the full season of two new shows -- McMafia and The Terror -- the same night those series aired on AMC's TV network. AMC Premiere should continue to gain traction with consumers as it rolls out to other streaming platforms, including YouTube TV and fuboTV. It's also important to note that AMC has had success launching apps, including games based on The Walking Dead series. Mobile gaming is a fast-growing market, expected to grow 25% this year to $70 billion. It's unclear how much revenue AMC has generated from its apps, but The Walking Dead apps have been highly rated in the App Store, and management sees this market as a long-term growth opportunity. With cable in decline and digital services on the rise, AMC is in a major transition phase. Ultimately, I believe the investment case boils down to whether AMC can produce compelling content to not only grow licensing revenue, but more importantly, boost its own digital subscription services like AMC Premiere. Given AMC's track record of producing hit shows, this shouldn't be a problem. Its digital services are gaining traction, and any growth from mobile apps would be icing on the cake. For investors who like digging for those potential diamonds in the rough that trade for low P/E ratios and have been overlooked by other investors, AMC could fit the bill.